At last month’s IDFA Milk and Cultured Dairy Conference in Indianapolis, industry experts gathered to discuss the hottest trends in fermented dairy foods, which are also known as cultured milk products, and run the gamut of cottage cheese to sour cream to yogurt. What characterizes these products as fermented foods is the inclusion of lactic acid bacteria, which during the fermentation period lowers product pH. This increases shelf life and provides a distinct sour or acidic taste as well as thickened viscosity. These attributes vary by strain of culture. Some such dairy foods bypass the inclusion of cultures through the addition of food-grade acid, which upon addition to milk, immediately drops the pH. These products are described as directly acidified, and in most countries, require such a call out on packaging. 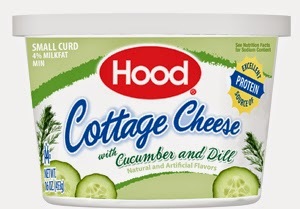 At the IDFA meeting, Massachusetts-based HP Hood received the Most Innovative Cultured Dairy Product award for its new Cucumber Dill Cottage Cheese. Hood introduced this flavor in early April, which was the same time it also rolled out a Garden Vegetables variety. The two new flavors join two other savory options--Chive and Chive & Toasted Onion—and three fruit options: Pineapple, Pineapple & Cherry and Peaches. You can read more about the new flavors HERE. Trend #1: This brings me to the first fermented dairy foods trend: Cottage Cheese. This curds and cream product is the original high-protein dairy food and is making a comeback as consumers embrace its versatility and nutrient density. I’ve written about opportunities in cottage cheese a number of times. You can access these articles by linking on their titles below. 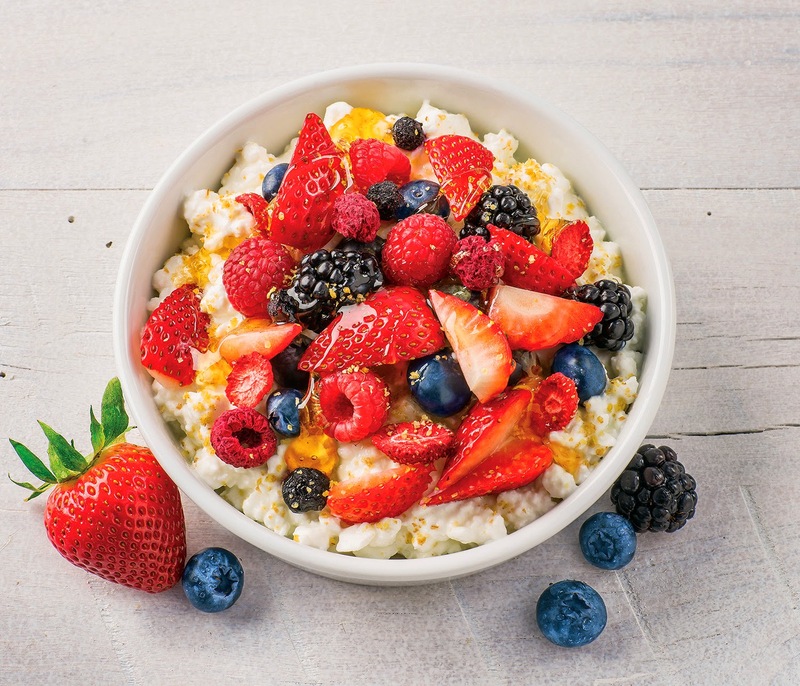 A number of cottage cheese marketers have started aggressively marketing their products, offering consumers recipe ideas and serving suggestions. For example, earlier this week, New York State-based Friendship Dairies kicked off a campaign called Mix-Ins, which is a collection of recipes to make quick snacks and light meals. Made with creative and delicious ingredient combinations, these culinary delights start with cottage cheese and suit every craving, purpose and fancy. 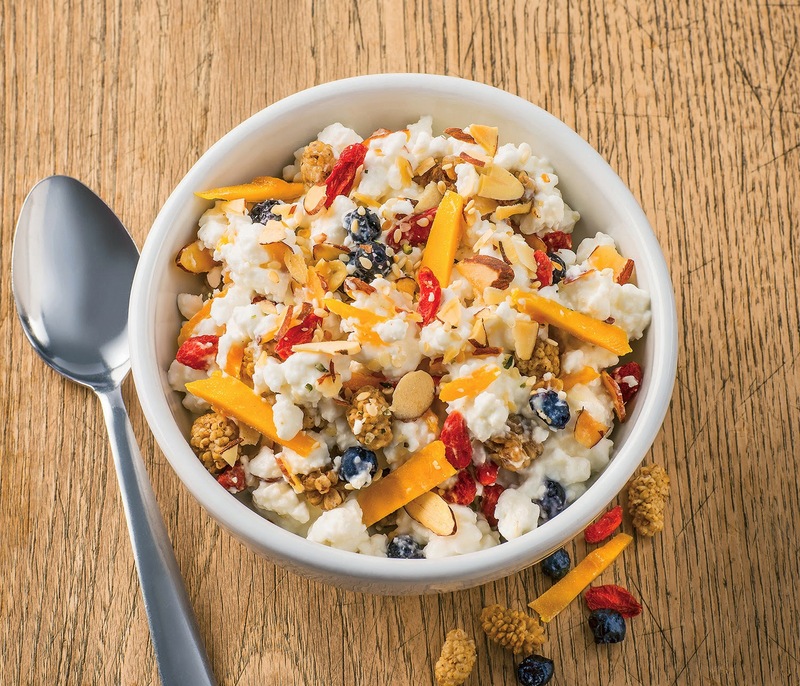 With 16 grams of protein per half cup, Friendship 1% low fat cottage cheese has more protein per serving than Greek yogurt and, when blended with sweet and savory elements, its crave-worthy appeal is heightened. 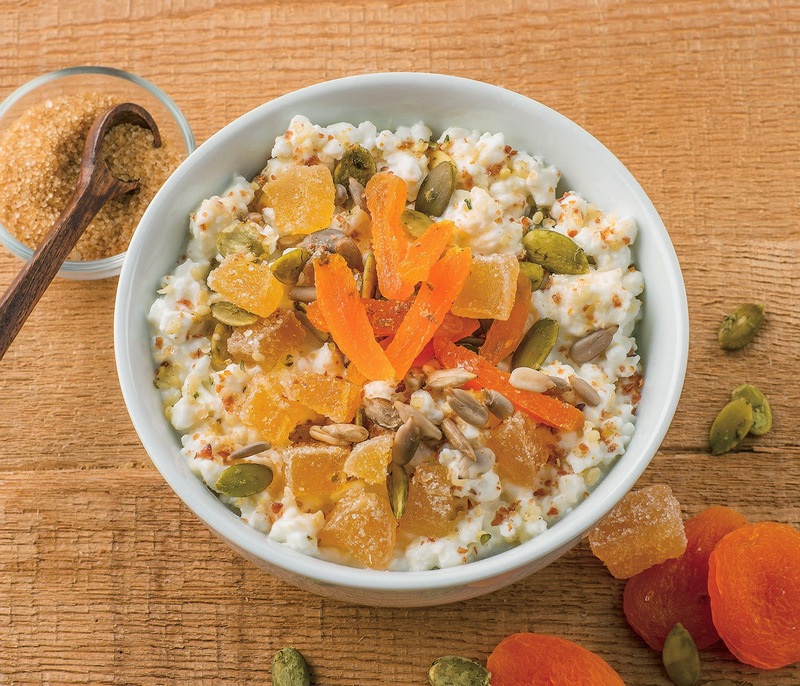 Protein Packed Mix-Ins include high-protein nuts and seeds like almonds, hemp and sesame to enhance cottage cheese’s already powerful protein punch. A combination of dried apricots, crystallized ginger, hemp and pumpkin seeds in the Protein Power delivers an energizing boost to get one through the day. Maple Bacon includes candied bacon bits, pure maple syrup and flaky sea salt. Smoked salmon, chives, red onion and poppy seeds make an inspiring carb-free version of Lox and Bagels. For those who prefer low-sugar, low glycemic-index foods, there’s Coconut Crunch, which is made with toasted coconut flakes, cacao nibs and chopped cashews with a sprinkle of coconut sugar. Perfect Pearing features fresh pears, toasted walnuts, fresh mint and dried cranberries. The Superfoods Trail Mix combination of dried mango with mixed berries as well as toasted almonds, hemp and sesame seeds is a nutritional powerhouse. For those who prefer a mini-meal to carry them through the afternoon or evening, the Puttanesca features sundried tomatoes, capers and olives drizzled with olive oil. Crunchy Kale is packed with crushed spicy kale chips, fresh chopped apples and toasted almonds. Everyone needs to splurge now and then so the indulgent Almond Delight features toasted almonds, shredded coconut, chopped dark chocolate and caramel sauce. Recipes can be viewed HERE. In Sweden, Arla offers mix-ins via a separate domed container, which also includes a spoon for the ultimate convenience in on-the-go consumption. 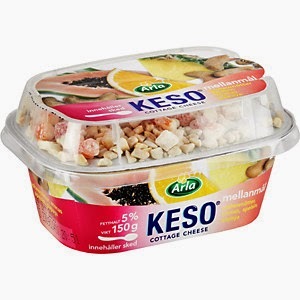 Arla Keso comes in two varieties: Cottage Cheese with Cashew Nuts, Pineapple, Orange & Papaya and Cottage Cheese with Hazelnuts, Blueberries & Cranberries. The product has an 8% fat content and comes in a 150-gram single-serve container. Though this product is not currently in the marketplace, a few years ago, U.K.’s private-label powerhouse Tesco offered a flavored cottage cheese concept that included a separate container for crackers. 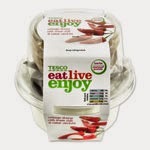 The Tesco Eat Live Enjoy line featured 170-gram packs in four varieties: Cracked Black Pepper Cottage Cheese & Multigrain Crackers; Natural Cottage Cheese with Cranberries, Apple & Pumpkin Seeds; Pineapple Cottage Cheese & Multigrain Crackers; and Sweet Chili Cottage Cheese & Water Crackers. Back in the States, Kemps was the first, and so far the only, to market Greek cottage cheese. 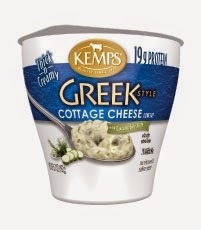 Kemps Greek Cottage Cheese comes in single-serve 5.7-ounce cups for on-the-go dining. Based on cultured skim milk, each single-serving contains an impressive 19 to 21 grams of protein thanks to the addition of whey protein concentrate and milk protein concentrate. A serving also contains a mere 2 grams of fat along with 130 to 180 calories, depending on variety. There are four varieties: Cucumber Dill, Peach, Pineapple and Plain. Trend #2: That brings me to the second fermented dairy foods trend: Greek. Not just yogurt, but cottage cheese, cream cheese and even sour cream. 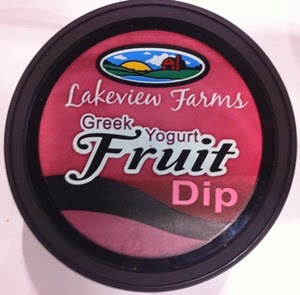 Lakeview Farms showcased its new Strawberry Greek Yogurt Fruit Dip at the International Dairy Deli Bakery Association (IDDBA) meeting earlier this week in Denver. The company also co-packs the Friendly Farms All Natural Greek Yogurt Fruit Dip for private-label retailer Aldi that comes in two flavors: Strawberry and Vanilla Bean. For more information, link HERE. Premium hummus and salsa manufacturer Zilks was also at IDDBA showing its five varieties of dairy-based refrigerated dips. The original Tzatziki, which entered the marketplace in 2012, got some kick at the beginning of 2014 with the introduction of Hatch Green Chili and Jalapeno varieties. 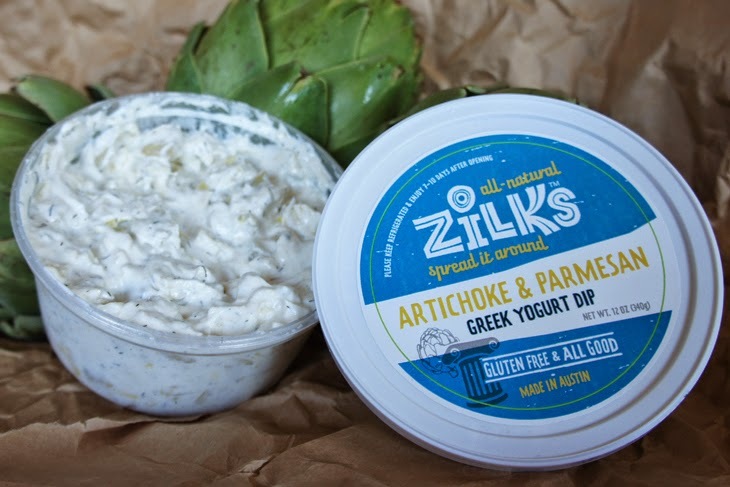 The company also offers two Greek yogurt dips: Artichoke & Parmesan and French Onion. For more information, link HERE. 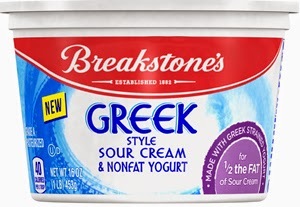 Kraft Foods combines full-fat sour cream with nonfat strained yogurt to makes its Breakstone’s Greek Style Sour Cream & Nonfat Yogurt, which is described as having sour cream taste with all the goodness of Greek yogurt. For more information, link HERE. With all these Greek cultured products, in particular strained Greek yogurt, comes an abundance of acid whey. Compared to sweet whey, which is produced during natural cheesemaking, acid whey, as the name suggests, is very high in acid content. It contains a significant amount of lactose and is very high in minerals, in particular calcium. Most importantly, it is almost void of protein, which is what makes sweet whey so valuable. Thus, acid whey, as is, has little value…but is in abundance. At the IDFA meeting, leading dairy processing researcher Dr. Karen Smith, who is with the University of Wisconsin Center for Dairy Research, provided insights into cutting-edge technology developments for unlocking the potential of yogurt’s acid whey to become a money-maker. She explained how acid whey permeate can be fractionated into value-added streams. 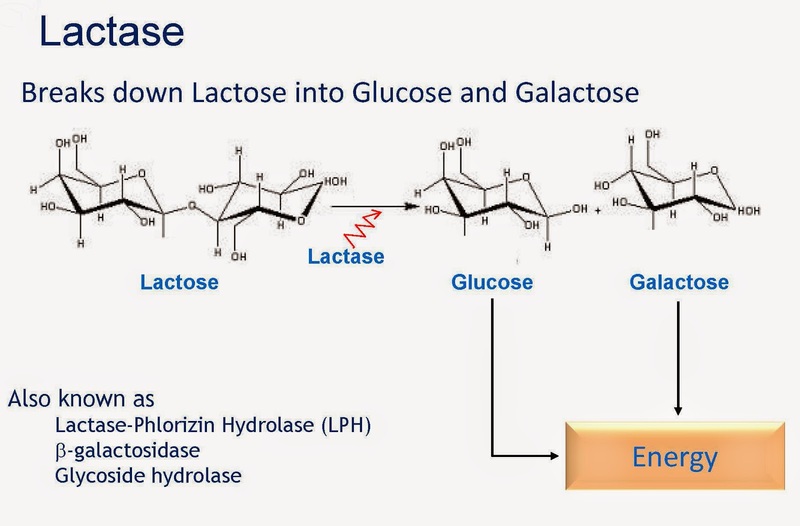 For example, the lactose can be separated and hydrolyzed to produce a dairy-based sweetener that could go back into cultured products or other dairy foods. Trend #3: That brings me to the third and final fermented dairy foods trend: Converting Lactose to Galactose and Glucose. 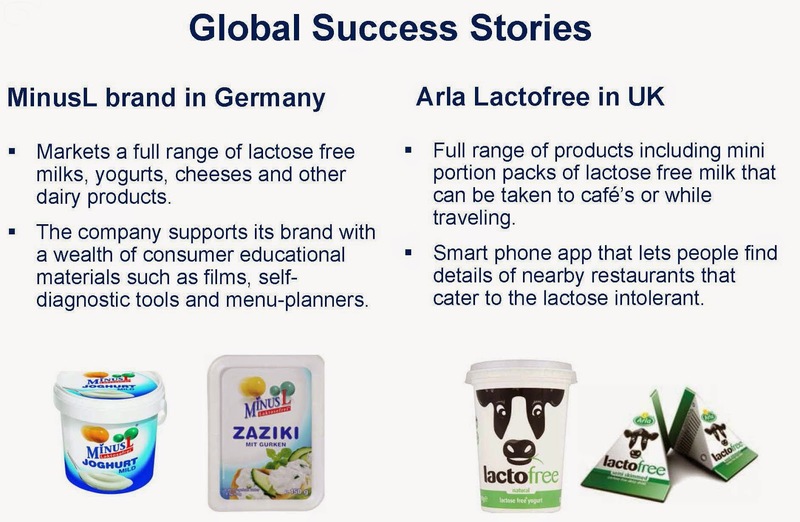 In other words, making cultured dairy products lactose free in order to appeal to the growing number of consumers who have or believe they have an intolerance to lactose. 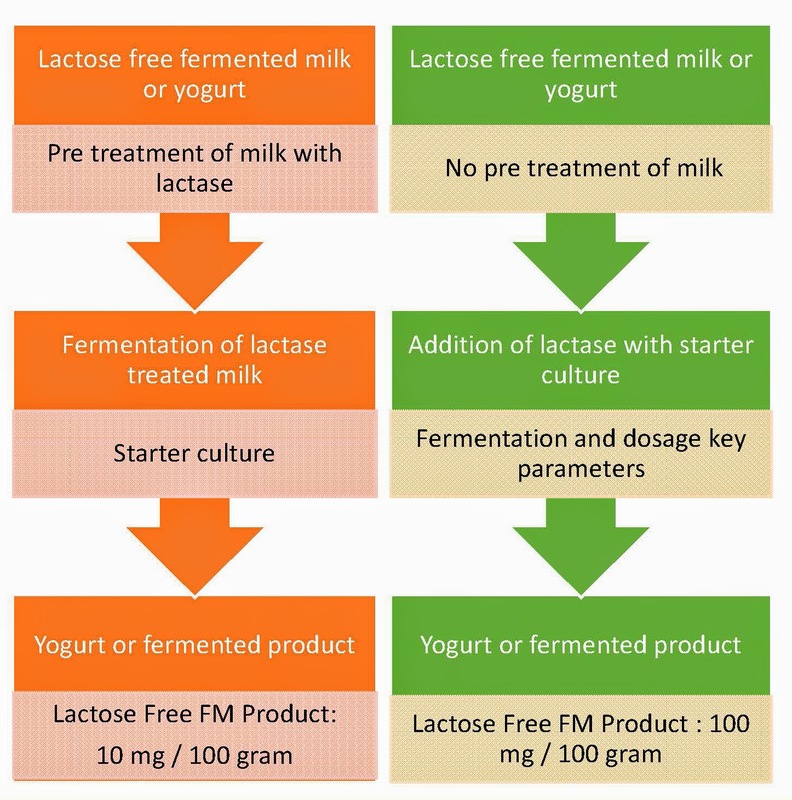 Lactose-free dairy foods are becoming more prevalent in Europe, as companies fight to keep consumers buying dairy instead of switching to dairy alternatives for the sole purpose of avoiding lactose. 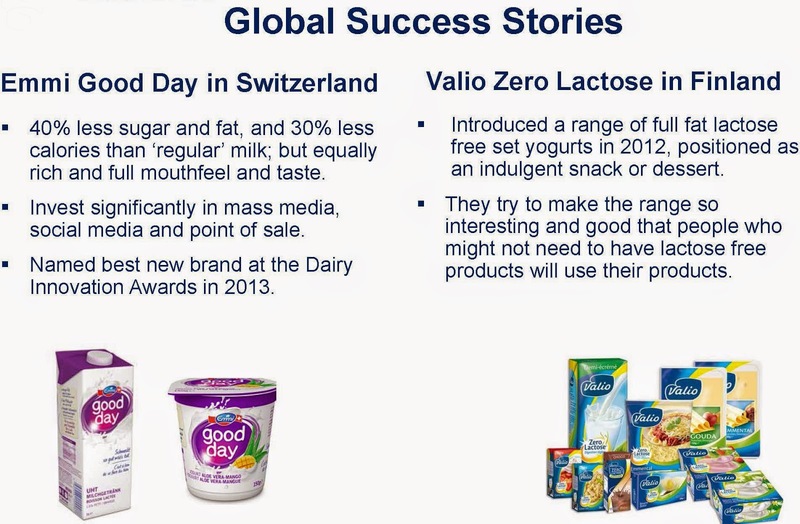 This is an opportunity for the global dairy industry. At the IDFA meeting, Chr. Hansen shared many success stories. See infographics. The Lactaid milk brand does an excellent job of communicating to consumers that lactose-free milk has the same nutritional profile of regular milk. Watch a commercial HERE. Follow these three trends and you are primed for fermented dairy foods success.